Joey and Dan breakdown what went down in the season finale of Celebrity Apprentice. Heading into the final episode Joey reveals this week’s highly anticipated and hotly contested Celebrity Apprentice Power Rankings. Dan and Joey break down the Universal Wizards episode of Celebrity Apprentice, touch on the clip show that came before, and try to incorporate a third mic on the show for the first time. Joey reveals this week’s all important Celebrity Apprentice power rankings. Celebrity Apprentice Recap: Who Stole My Phone? Dan and Joey go over Tweetgate 2015, the La Cucaracha controversy, and the shocking firings that happened on the Feb. 2nd episode of Celebrity Apprentice. 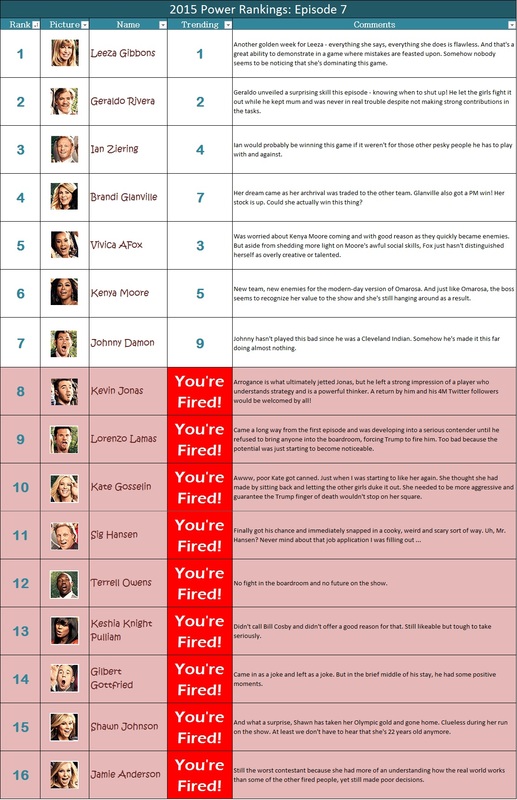 Joey reveals his power rankings for Celebrity Apprentice this week. Plus some bold predictions about next week. Bold! Dan and Joey go over when went down on tasks 8 and 9 of Celebrity Apprentice. Joey reveals his patent pending power rankings for the week. Dan and Joey go over tasks 6 and 7 of Celebrity Apprentice. This one featured Joan Rivers showing up, coffee factoring into both tasks, Geraldo in a top hat and two more firings.